MILAN (AP) -- Italy on Monday refused to back down on its plans to ramp up public spending, keeping alive a dispute with the European Union, which is worried the budget would increase the country's high debts. 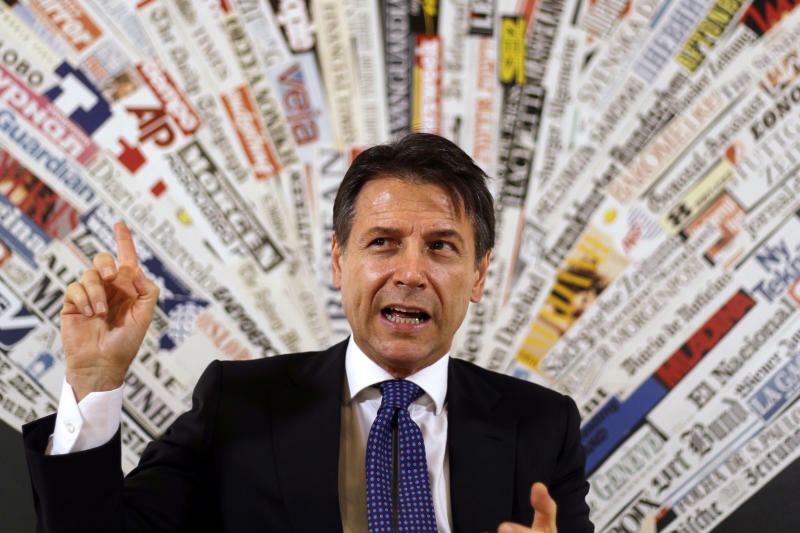 Premier Giuseppe Conte defended the budget in a news conference in Rome following the noon deadline for Italy to submit its response to the EU's rebuke of the draft budget. "If today, confronted by the EU letter, I would say that we made a mistake and we re-write the maneuver, that would mean admitting that we made the wrong maneuver," Conte said. "That is not the case." The plan increases the deficit to 2.4 percent of GDP next year, three times more than initially targeted by the previous government. The EU complains that the plan means Italy will not lower its public debt as promised. At over 130 percent of GDP, debt is more than twice the EU limit and economists worry it is a risk to the region's financial markets. In the letter to the European Commission, Economic Minister Giovanni Tria said Italy would adjust the plan if it does not deliver the expected dividends, but that the spending boost and reform course were necessary due to "particularly unsatisfactory macroeconomic and social conditions a decade after the beginning of the crisis." The letter said that the budget plan "does not pose any risks to the financial stability of Italy, or the other European Union countries." Conte the budget was "well-conceived," and that it would promote economic growth. He noted that the 2.4 percent deficit level was a ceiling and held out the possibility that it would not reach that level in 2019. He also repeated that it would be brought lower in the following two years. Investors and financial experts are skeptical. Even before knowing whether Italy would back down from its proposed deficit increase, credit ratings agency Moody's downgraded Italy by one notch to just one level above junk status. It gave Italy a stable outlook, meaning it is not currently considering another downgrade. Conte said that underlined that the Italian economy's "fundamentals are good." Italy's plans have widely been criticized by EU leaders as being out of line with the bloc's spending constraints. The EU Commission handed Italy a stinging letter last week warning that the higher deficit targets represented a deviation "unprecedented in the history" of EU budget rules. Margaritis Schinas, the European Commission spokesman, said Monday that Italy's response "has just arrived" and added that on Tuesday "the Commission will discuss the procedure and will determine" its next steps. Conte was critical in his remarks of EU officials, whom he said spoke out of turn by slamming the budget draft and Italy's response before receiving either. He also said that citing treaties alone would not persuade Europeans who are disillusioned with current policies. "Today we are living years in which Europe is languishing," he said. He added that blaming populists or nationalists misses the opportunity to "assume the burden of evaluating what are the causes and see how to relaunch Europe." He also emphasized that Italy had no intentions of exiting either the European Union or the 19-country euro currency, recalling a famous phrase used by U.S. President George H.W. Bush. "Read my lips. For Italy, there is no chance, no way, to get Italexit. There is no way to get out of Europe and the eurozone."